I am sure it has been painfully obvious by my posts that I have been blogging from my Android phone for….over a year. It has been supremely difficult to update my pages and add those special touches that only a full computer can offer. Don’t get me wrong, the Android application for WordPress is awesome and all the updates just keep getting better! It is great for on the go posting and I will likely still use it as such. 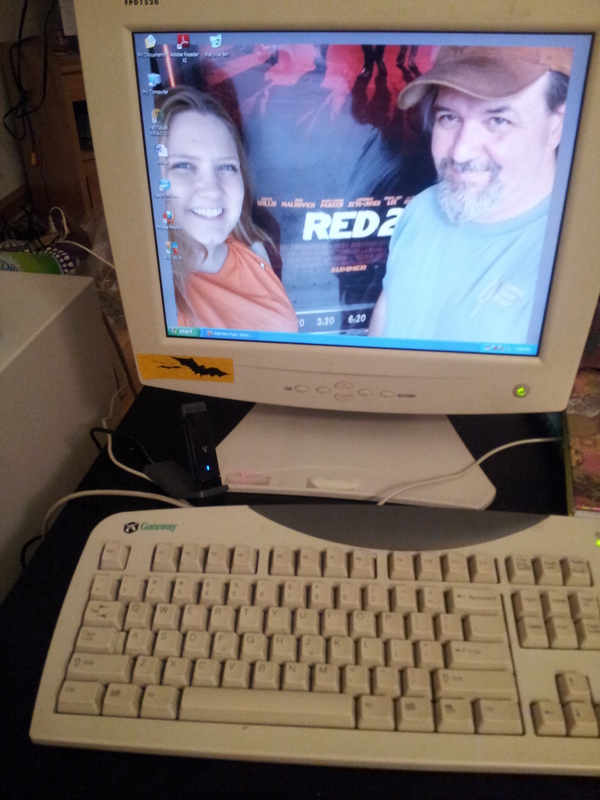 I have already messed with the old desktop photos and added my first sticker to the monitor. On the bottom left of the monitor is the bat symbol. Typical symbol of cavers. I haven’t just dealt with the cosmetics of it. I got a USB wifi converter so I don’t have to use an ethernet cable. And I added a ton of updates to the virus protection software. I tried to download the Spotify player, but ran into some major playback issues, which means I’m stuck with the web player. I have been making blogging plans the last few days. You might just pee yourself. Okay, well, maybe not that exciting. Please, go and inkle if you have the inkling. Don’t wait on me to stop spazzing about the fact that I have a computer again. I have been able to update my About Me page. There are very few differences if you have already read it. I just made sure that my dates and such are appropriate. You may not have noticed, but it was driving me nuts that my 365 Series Page wasn’t fully updated since I completed the blog series. It has said *Under Construction* for months. I finally fixed it!! Check out my 365 Series: 301-265. I hope to have more fun blogs coming up soon. However, I must get my computer legs underneath me before I just post ten blogs in one day and overload with excitement. Can you see the hidden shapes on top of the crust? I attempted to cut the vent holes with the same shape, but they stretched and lost their awesome. 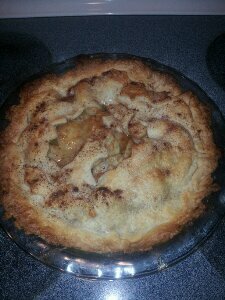 I used the fantastic apple pie recipe I found online and it is almost perfect. But instead of apples I used pears from our farm. I forgot that I decreased the temperature of the oven the first time I used this recipe. 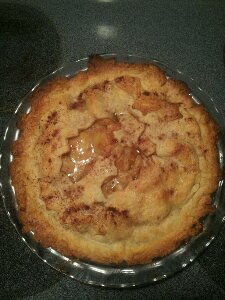 So…my crust was well done and my fruit was still a little hard. We’ll see what my coworkers think.of it today. I’m nervous and not entirely thrilled that I made such a silly irrevocable mistake. My coworkers made it disappear easily during my eight hour work shift. Everyone agreed the crust and flavor was great. They made some legit recommendations about a future fix. First, being if I have particularly hard fruits, I could cook them down in a sauce pan with the sugar to help soften them up. Second, they also agreed that 375°F was high for pie and I should lower the temp. I also hope to cut up my pear chunks into more even sizes. I think the larger pieces were the undercooked ones. You may recall one of my recent blogs about Fixing the House. The epic continued as we stripped off the trim and molding—and I found out we would definitely have to repaint it. Again.—We must have vacuumed about five times to make sure there weren’t a ton of loose bits on the floor. 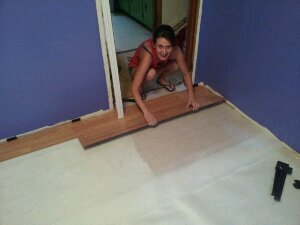 Then we starting unrolling, sticking down and cutting tthe foam underlayment. I said, “HT, hold the roll up so I can cut along the wall.” And the above picture was her response. I made her hold the pose as I ran for my phone and the hilarious picture of her above. After much grumbling, measuring and consultation of the instructions, the first row of boards were laid down. I have to give a shout out to Kit on this one. 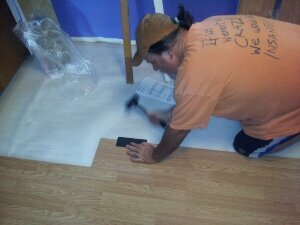 He read the crummy instructions, got all the tools, measured, cut, hammered and more to get that floor in. He is great! Don’t let the pictures fool you, after the first few boards were put in HT and I went to fix a massive pot of spaghetti, breaded and baked mushrooms (very loosely based on this recipe) and a green salad. Another friend came over because he wanted to learn how to install this type of flooring. Kit and I got tons of work done with such willing helpers! Kit worked quickly and well. We finally took a break for supper and decided to pick it up the next day. That’s when I helped the most, because everyone was at work on in school. 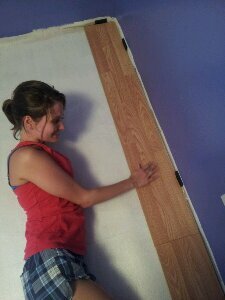 The flooring was tedious, there was a lot of fudging and techniques you had to learn along the way to make it work. The last piece wanted to be a monster, but Kit finally make it happen. 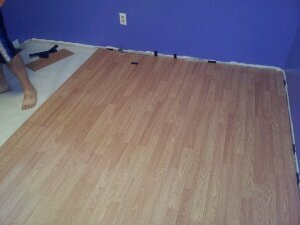 Thankfully, after all the cursing, we finally have a completed laminate floor!! Supper was slamming too, by the way. Piecing together a broken ornament for my mom. Although this ornament would break if you breathed too heavy on it I thought this meant something. Gluing Peace back together. It is broken. We are at war with our neighbors, nature, ourselves. Accepting self is a hurdle many people never scale. I have battles accepting myself at times. How can we be in harmony with anything if we cannot feel good about ourselves. Calm down, I won’t go super spiritual on you guys. Donno why fixing my mom’s ornament struck me so much. Just got the impression that we need to try to fix what is broken. Your pieces may become a peaceful whole.